Another two chipmunks trapped and relocated! I changed my bait. Instead of a glob of peanut butter on the tray, dotted with birdseed (which attracted more ants than rodents), I put a shallow tin cup filled with birdseed behind the trip-tray. The only way to access the seeds is to step on the tray. 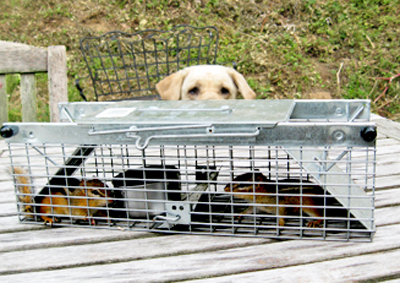 I caught two fully-grown chipmunks this morning, between sunrise (when I first checked the traps) and 7:20 a.m. I immediately photographed them, and drove them to the Relocation Center. MacKenzie was beside herself with excitement. She kept bumping the cage with her nose, and I finally got her to sit down quietly and watch, while I raced for my purse and keys! She came with me in the car, and we dropped the two refugees before 7:40 a.m. — then it was a race to get ready for work, out the door, and interact with a different type of wildlife entirely.